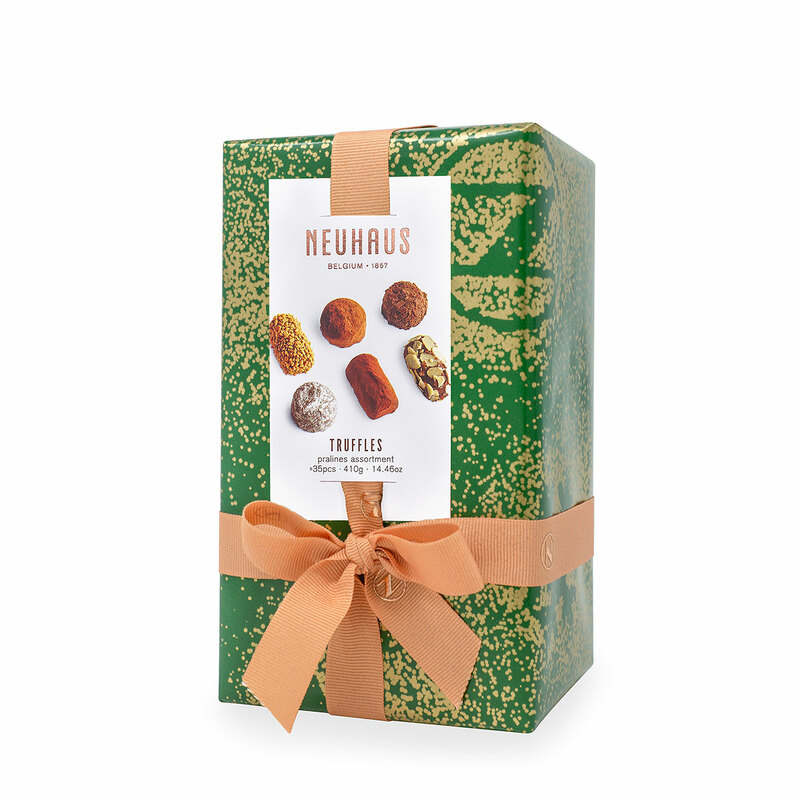 Celebrate the holidays with the Neuhaus Ballotin filled with truffles. The Ballotin is specially dressed for the holidays in green gift wrap with a gold spark. 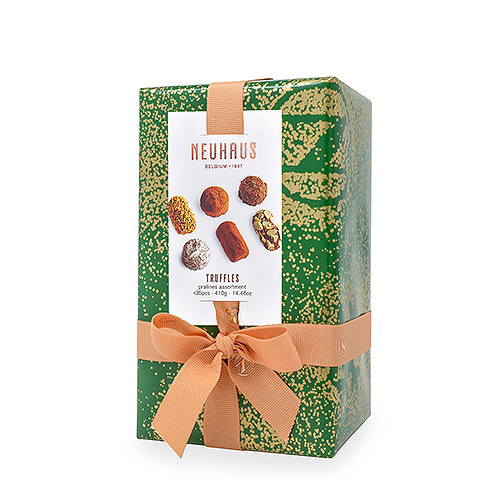 A hand-picked selection of classic Neuhaus Truffles filled with buttercream, enrobed with a thin layer of dark chocolate and refined finishing decorations. Melt-in-your-mouth truffles in flavors such as classic butter truffle, extra dark, coffee, cognac, Marc de Champagne, and tiramisu are the perfect way to celebrate the holidays. Ingredients: Sugar, cocoa mass, butter (contains milk), palm oil, cocoa butter, cocoa powder, whole milk powder, butter oil (contains milk), Amaretti granules (sugar, wheat starch, wheat-flour, bitter apricot kernels, egg white, colour: E150b, flavour, raising agent: acid ammonium carbonate), roasted almonds (treenuts), coconut oil, glucose syrup, skimmed cocoa powder, stabilizer: glycerol of rapeseed, cream (contains milk), cognac, dextrose, emulsifier: soy lecithin, sunflower oil, flavours, palm kernel oil, coffee, amaretto extract (alcohol, water, flavours, colour : E150a), marc de champagne, wheatstarch, acid (citric acid), water.